Ed Sheeran touched down in New York City the other day, making an appearance on ‘Good Day New York’, where he did an interview and performed ‘The A Team’. 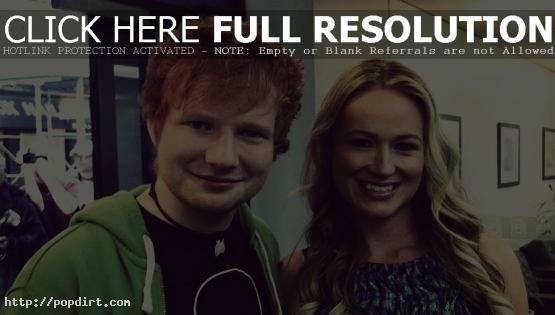 Backstage, the English singer songwriter ran into another popular recording artist, Jewel. Watch the performance at myfoxny.com. Been working hard to be up to speed for my first scenes for the June Carter Cash story. Begin shooting Tuesday. But I miss my tweets – how are you all? I have some exciting news! On April 13th at 2 pm PT I will be performing live via Ustream presented by AT&T and Cisco! I will be playing a few of my songs and answering fan questions afterwards! Be sure to tune in! Can’t wait to see you all there. Jewel and her husband Ty Murray tell People magazine they’re having their first child. “I took a pregnancy test and it was positive,” said the 36-year-old singer songwriter, who is in her second trimester. “It was so hard to keep it a secret. I was worried I’d start throwing up on set and everyone would be like, ‘Oh, she’s pregnant. '” The couple are currently remodeling their home, converting the guest room into a nursery for the baby. Read more. Jewel has posted a video in support of the ‘It Gets Better’ project, where the singer songwriter talked about her first crush being with a guy in high school who was gay, and how a friend told her he wouldn’t be her friend if she remained friends with a gay friend. “It breaks my heart that anybody would want to take their own life for how they are,” Jewel said. “It’s totally fine. It’s okay to be exactly how you are.” Watch the message via YouTube below. In the exclusive premiere of ‘Betwixt The Music’, Jewel tells the story of the band she formed with Sarah Palin and what led to their eventual break up. “Did she steal from me,” Jewel says in the FunnyOrDie.com clip. “Years before she ever did it in real life, did I happen to write a song called ‘Shooting Wolves (From Helicopters)’? I inveted those catchphrases that she says, like pallin’ around, goin’ rogue, you betcha. Just look at my book of poetry, you’re gonna see a lot of Sarah Palin ‘originals’.” Watch it below.